Cannabis is one of the most illicit used drug, which is very popular globally. Cannabis is basically a flowering plant from the Cannabaceae family. Cannabis is popular by its various names such as hemp and marijuana. The two terms are used for different purposes. Hemp is generally used to refer only the varieties of cannabis cultivated for non-drug use or for non- psychoactive effects. The term marijuana is used to refer the psychoactive cannabis or the cannabis which is used for the medicinal as well as recreational purposes. In this report only the legalized medicinal and recreational use of cannabis is considered. In terms of value, the global dried herbs market is expected to reach a market value of US$ 81.47Bn by the end of 2027, with an expected CAGR of 17.2% over the forecast period. Many countries have been permitting cannabis and legalizing the use of cannabis both for recreational and medicinal purposes. At present, in the U.S., thirty four states (including Washington DC) have legalized cannabis for medicinal purposes, while ten states among them have even legalized cannabis for recreational and medicinal uses. In 2018, Canada became the second country in the world, after Uruguay, to legalize the cultivation, acquisition, possession, and consumption of cannabis and its by-products. The increasing legalization activity of cannabis by government of various nations aims at preventing illegal usage, trafficking, and crime associated with the cannabis thus promoting the growing market of legalized cannabis across the world. The market for legalized cannabis is anticipated to witness a growing demand owing to the use of legalized cannabis in medical and pharmaceutical applications. The legalized cannabis is used increasingly in the treatment of anxiety, sleep disorders, pain, and other medical conditions. The researchers are increasing studying chemicals found in the legalized cannabis to incorporate them in the treatment of several ailments and to discover new medical applications. Legalized cannabis is used to pacify and lessen the effect and pain from ailments including neuropsychiatric anxiety, disorders, epilepsy, cancer, and other conditions. Cannabis provides multi-sensory appeal providing visual, olfactory and tactile experience in addition to the psycho-active effect. The multifaceted sensory appeal drives a large population to consume legalized cannabis. The legalized cannabis has made it easier and convenient for the population who are wanting to consume cannabis for experiencing the sensory appeal of the products. Legalized cannabis application across the wellness and beauty sector is speedily evolving. CBD (Cannabidiol) oil in specifically gaining lot of traction in beauty and wellness sector. CBD oil is non-psychoactive and provides relief from anxiety, pain, and depression. It also holds anti-acne and anti-inflammatory properties to tract skin conditions. The legalized cannabis CBD oil is used in color cosmetics including mascara and lip balms. The growing demand for cosmetics and personal care is thus opening the way for cannabis. Due to augmented legalization, cannabis is becoming more unified into consumer products targeting beauty and wellness. The food industry is witnessing cannabis edibles take off over the last decade. The growing market for cannabis infused drinks and food products is creating more and more demand for legalized cannabis. Legalized cannabis is used in baked goods, confectionery, tinctures, and others to cater to the growing demand for cannabis edibles. Dixie Elixirs, Colorado-based company, is one of the first companies to enter the food and beverage market with legalized cannabis edible products. The company sells cannabis-infused products such as juices, chocolate bars, truffles, mints, and many more. The increasing urbanization and changing pace of living, along with the hectic lifestyles have lead consumers incline towards consuming legalized cannabis. The consumers are moving towards cannabis as it contributes to comfort the symptoms of depression such as sleeplessness, sorrow, irritability, and absence of liveliness. Besides, it gives outstanding relief for arthritis and other inflammatory joint issues, relaxes mind, when taken in nominal amounts and hence legalized cannabis is creating strong demand amongst the consumers. The demographics for risk taking youth is increasing at a faster rate. The largest consumers for legalized cannabis are youth which are ready to take risk of consuming cannabis despite of several warning and health issues related with its consumption. The legalization has made it easier for today’s youth to get accessibility of the cannabis along with an aim to prevent illegal trafficking and crime associated with availability of cannabis. Thus, the increasing number of youngsters are opening the way for legalized cannabis over the forecast period. Cannabis also known as marijuana, is a psychoactive drug derived from the Cannabis plant. The main psychoactive part of cannabis is THC i.e. tetrahydrocannabinol. Cannabis is used for medical or recreational purposes. Many regions across the world have illegalized the use of cannabis, however, many of the countries have legalized either medicinal or recreational, or both the uses of cannabis. Cannabis can be used by smoking, vaporizing, within food, or as an extract. 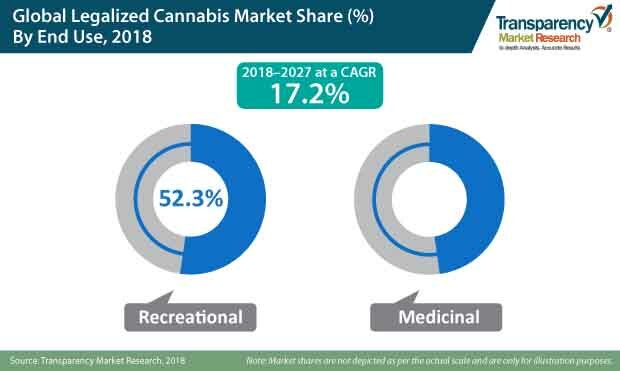 The proposed market report of TMR on the global legalized cannabis market evaluates the opportunities in the current scenario, and provides the latest updates and detailed insights corresponding to different segments involved in the global legalized cannabis market during the forecast period 2018-2027. The legalized cannabis market report further indicates the estimated data for 2018, and forecast data up to 2027 in terms of value (US$ Mn) and volume (MT). In terms of value, the legalized cannabis market is anticipated to increase at a CAGR of 17.4% during the forecast period. The present study exhibits the market dynamics and trends of the legalized cannabis market in regions such as North America, Europe, Latin America, Asia Pacific, and the Middle East and Africa. The report includes the market growth drivers and challenges for the global legalized cannabis market, and their impact on each region during the forecast period. The report also comprises the study of the drivers, restraints, threats, and opportunities for the legalized cannabis market to provide a substantial view. It also includes the value chain analysis and opportunity analysis of the market. The report explores the global legalized cannabis market for the period 2018-2027. The principal objective of the legalized cannabis market report is to provide insights into key developments in the market that are constantly supporting the transformation of global businesses that are associated with legalized cannabis. It is very important to consider that, in an ever-wavering economy, we provide the estimated (Y-o-Y) year-on-year growth rate in addition to the Compound Annual Growth Rate (CAGR) for the overall forecast, to better understand the analysis and evaluation of the global legalized cannabis market, and to discover justifiable opportunities. The unique key feature of this report is that, the evaluation of the global legalized cannabis market and its relative revenue forecast is carried out in terms of absolute dollar opportunity. This is usually not considered while forecasting overall market value. Absolute dollar opportunity analysis is very crucial in evaluating the intensity of opportunity that a provider can observe to execute, as well as to contrast the potential resources from a sales perspective in the global legalized cannabis market. The legalized cannabis market report starts with an elaborate executive summary, the market definition of various segmentations that are included, and their respective shares in the legalized cannabis market. The report also provides insights regarding the major macroeconomic factors that have a significant effect on the growth of the legalized cannabis market. The market report further emphasizes the various dynamic factors that influence the legalized cannabis market, which include the drivers, restraints, opportunities, and trends in the global legalized cannabis market. The report further underlines the study of the present issues with industrial processing, and opportunities for the legalized cannabis market. It also includes value chain analysis that provides a comprehensive view of the overall profitability from the raw material supplier to the final end user in the legalized cannabis market. In order to give users a clear view of the global legalized cannabis market, we have exhibited a competitive analysis of key market participants and their strategic developments. The competitive dashboard presents a detailed comparison of global manufacturers of legalized cannabis on vital parameters such as product portfolio, total revenue, key developments, and key strategies. The study presents the legalized cannabis market attractiveness analysis by end use, product type, form, compound and region. To analyze the overall market size of legalized cannabis, the report on the legalized cannabis market considers various preliminary aspects based on secondary research. Furthermore, it highlights quantitative estimation such as market share by end use, product type, form, compound, and region, and other qualitative data from primary respondents, which have been integrated to arrive at unambiguous and accurate market estimations. The forecast presented in the legalized cannabis market report arrives at the total revenue being generated, and the expected revenue contribution in the future by the global legalized cannabis market.